Within a single individual there are two copies of their genetic material, and in some instances, one copy is different than the other and is called a genetic variant. The authors first assembled the full genomic sequence of an individual from Florida and then, using it as an anchor, reconstructed the genetic variation contained within single individuals. Depending on the amount of the genetic variation at certain intervals across the genome, the authors were able to recover the population sizes of each species at different times in the past. When a species declines during an extinction event, it loses more and more genetic variation and sometimes does not have much to work with during the recovery period. Scientists call this a genetic bottleneck. Orbicella was able to recover after the bottleneck. “It’s incredible how predictions from genetic data correlated so well with observations from the fossil and environmental record,” said Michael DeGiorgio, assistant professor of biology at Pennsylvania State University. Authors are from STRI, the National Museum of Natural History, Pennsylvania State University, University of Iowa, U.S. National Oceanic and Atmospheric Administration, Hudson Alpha Institute of Biotechnology, Universidad Nacional Autónoma, Australian Research Council Centre of Excellence for Coral Reef Studies and University of Queensland School of Biological Sciences, Florida State University, Natural History Museum and the Systems Biology Institute. Prada, C., Hanna, B., Budd, A.F., et al. 2016. 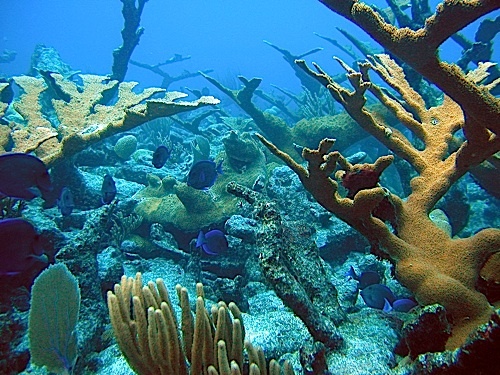 Empty niches after extinctions increase population sizes of modern corals. Current Biology.